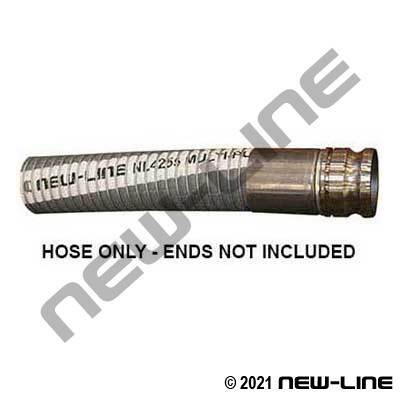 NL4255 is a very popular, heavy duty composite hose that has a polypropylene coated steel internal helix and a galvanized steel external wire. Composite hose is manufactured from multiple tight-wound thermoplastic films and tubes that create a barrier to permeation. Specialized manufacturing process techniques assure the proper gauge and pitch of the inner and outer wires to ensure conformity and consistency every time! The result is a truly flexible thermoplastic composite hose that doesn't kink or collapse with exceptional service life and offers superior safety and performance for the transfer of liquids or vapour (not for use with abrasive products).. It offers a much better "force-to-bend" rating as compared to traditional rubber hoses. It is commonly chosen where user handling is of prime importance and can be used for suction or discharge of gasoline, diesel, biofuels, paraffin, 100% aromatics, and various chemicals (refer to chemical charts) in tank truck, railcar, ship-to-shore, or in plant service. As compared to conventional rubber hose, composite hose has up to a four times smaller bend radius and can weigh 30% less than more bulky and less flexible rubber hoses. Furthermore, in the event of a hose failure, composite hose will not "burst" like a rubber hose but will "weep" liquids. Due to its construction, composite hose is not designed for very abusive or abrasive applications. It must be noted that due to its "rough" bore, composite hose will typically restrict flow by 10-15% as compared to smooth bore rubber hose, with some more economical composite brands reaching up to 25%.